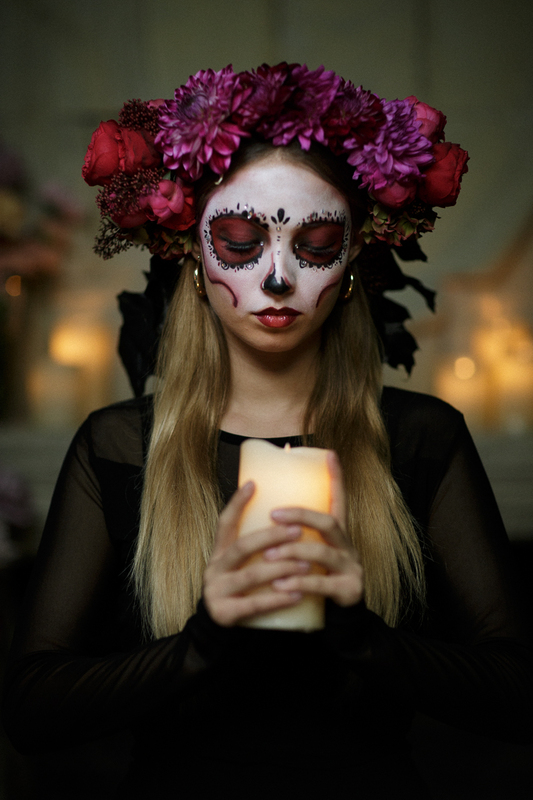 Originating from Mexico, Dia de los Muertos (also known as Day of the Dead), is a celebration honouring loved ones that have passed on to the next world. It's the coming together of the dead and the living. 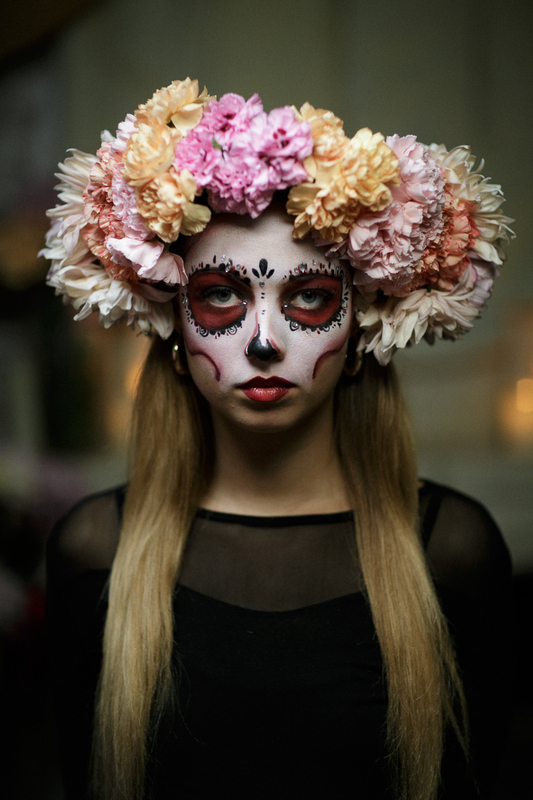 To mark the occasion, people adorn themselves in beautiful, symbolic flowers and paint their faces as calaveras, which are ornate skull designs. It’s common to see revellers with only half of their faces painted to represent life and death coming together. The day also calls for an abundance of candles and flowers, which help guide the spirits to their altars. 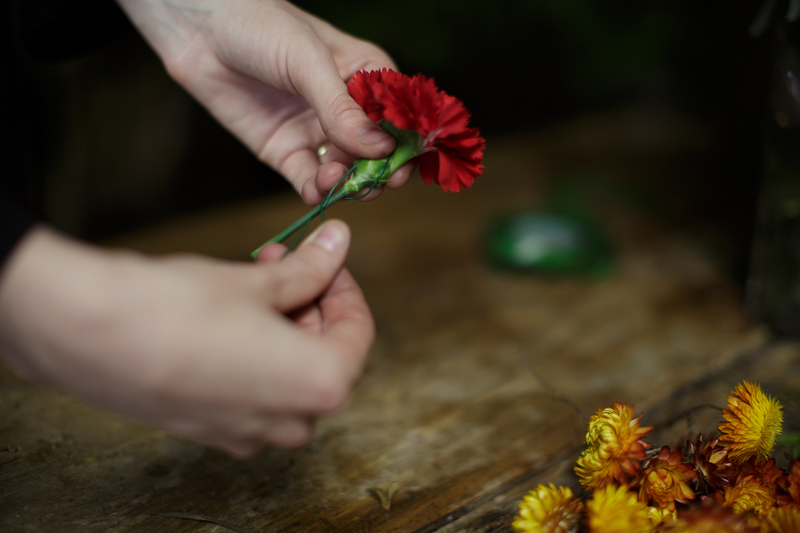 Traditionally, fragrant autumn flowers, such as marigolds, are used to make the souls feel welcome. When laid out with candles, it is said that marigolds create an illuminated spiritual walkway for the departed to return and reminisce in the delights of their previous life. This crown was made using: Hydrangeas, Carnations, Marigolds, Helichrysum, Heather, Astrantia. 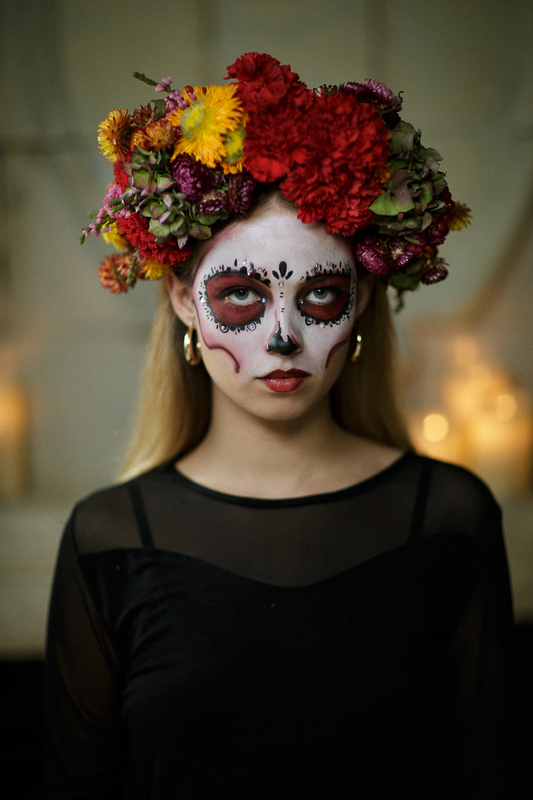 Dia de los Muertos has become very popular around the world, so we teamed up with talented floral designer Kitten Grayson to create stunning and elaborate flower crowns. Kitten incorporates a wide selection of flowers to craft a striking yet modern look. To finish the off the outfit, we brought on board Mia, a make-up artist from The Gypsy Shrine, to show us how to perfect a stunning skull face paint design. A selection of flowers (around 30 stems in total per crown). For this crown, we used a selection of Carnations, Roses, Sweet Williams, Hydrangeas, Zinnias, Pin Cushions, Strawflowers, Dahlias, Chrysanthemums and Palm leaves. 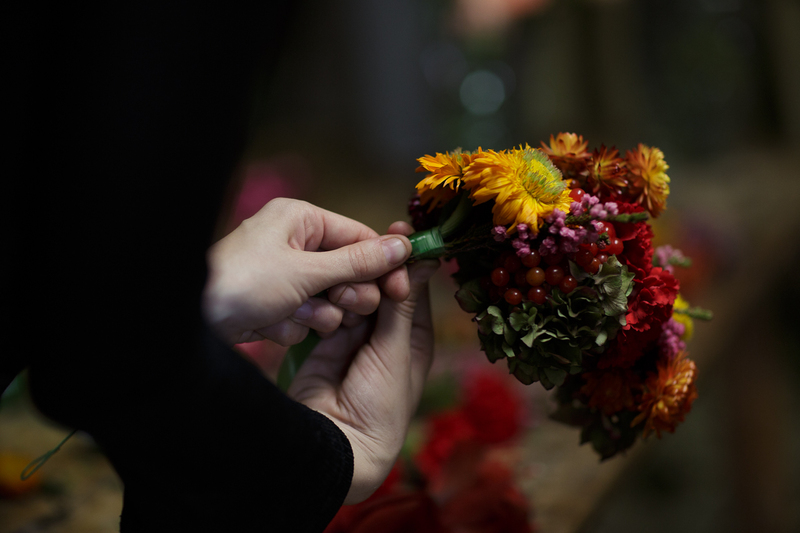 Trim the stalks of your flowers so they are just 5cm in length, and discard any loose stalks and leaves. Cut your silver wire into 20cm lengths. Take one of these lengths and bend to create a u-shape. Take your flower stem and place the u-shape on top of the stalk, then take one leg of the wire and twist it around the flower stem. 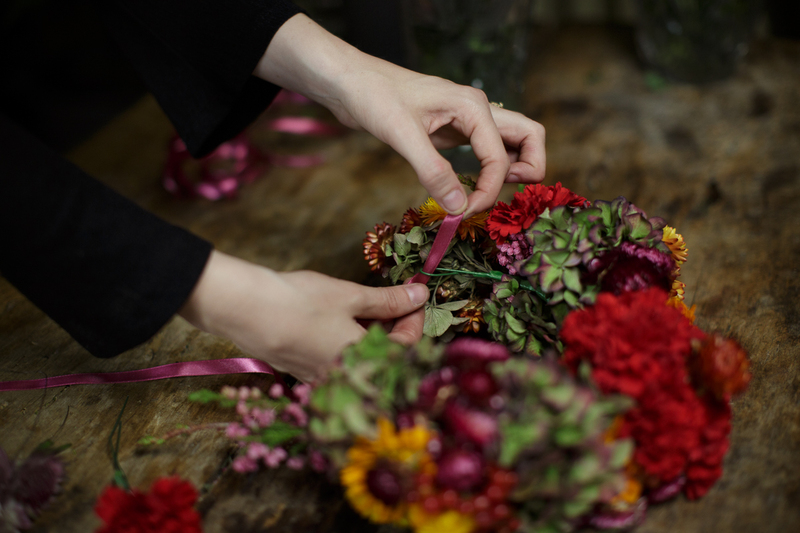 This will ensure all of the flowers can be easily manipulated around the crown. For bigger flowers such as hydrangeas, break them up into smaller florets and wire up each section. Repeat this for all your flowers, so that each stalk is wired up. Now you want to create the base of your flower crown. To do this, take two pieces of gauge wire. Use your second wire to extend the length of the first, overlapping the two so that they join in the middle but make one long wire shape. 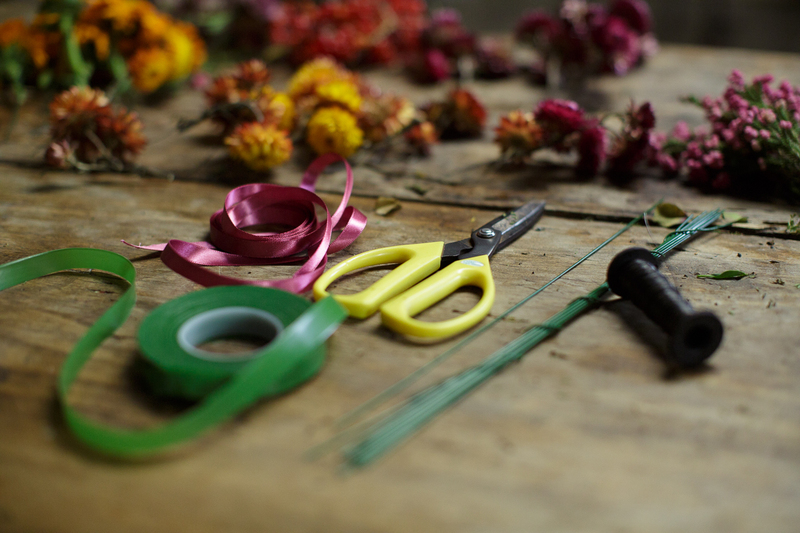 Take your floral tape and starting at one end and twist around and down to bind the wires together. You will end up with a single long wire, covered in floral tape. Take the two clean ends of wire and bend in to create a U shape loop on each end. This is for your ribbon to thread through at the end. Now it’s time to attach the flowers to your crown! Lay out your flowers in front of your crown, to map out your desired design. 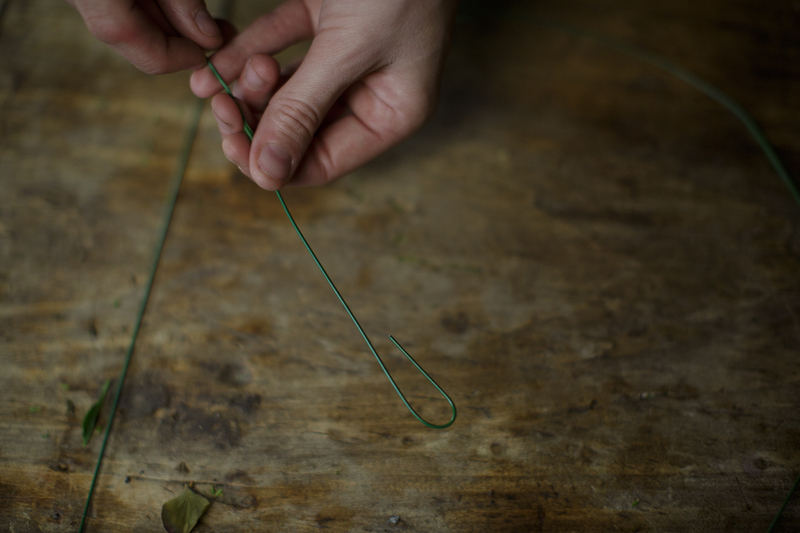 Then, leave a 10cm gap from the end of the wire to start by taking one of your wired flower stems. Lay it on top of the gauge wire. Take your floral tape and wrap it around the stem and crown to attach it. You can manipulate the shape of the stems. Continue to repeat this process with your flowers, placing them in nooks and crannies around each other, layering them up the crown. You can trim back excess wire along the way. Move in the direction towards the middle of the wire crown. Adorning yourself with flowers always makes you feel wonderful and ready for a good night out! Check out the other two crowns we created in varying shapes and colours. This stunning floral crown was made using : Carnations, Chrysanthemum. This crown was created using: Chrysanthemum, Dahlia, Piano Roses, Skimmia, black painted beech leaves. Now you've got the look, check our round up of Dia De Los Muertos and Halloween events to enjoy!